Diagram of an intermittent catheter in place in a male for Clean Intermittent Catheterization (CIC). There are three types of catheter products that are used for managing urinary incontinence: indwelling (sometimes called a Foley) catheters, suprapubic catheters, and intermittent catheters. The process of catheterization prevents a difficult-to-empty bladder from becoming overly full and backing up into the kidneys. This prevents kidney damage because these catheter drains urine from the bladder. CIC is a procedure in which you learn to catheterize yourself when you need to urinate, by inserting a catheter into your urethra, usually about four times per day. The catheter is inserted and then the bladder is drained until it is time to urinate again. Clean intermittent catheterization is usually used by individuals who have difficulty emptying their bladder due to having a neurogenic bladder. Because a foreign object (the catheter) is being inserted into the urethra, there is a chance of introducing bacteria into the urinary tract, which leads to greater instances of urinary tract infections. To reduce the risk of infection, be very careful to always keep the catheter free of bacteria and perform catheterization under the cleanest conditions possible. Because CIC drains the bladder, completely removing residual urine, it causes fewer urinary tract infections than using an indwelling catheter. It is usually the first choice of the three options when catheterization is necessary (aside from during surgery, when an indwelling catheter is used). It can be challenging for some people to learn self-catheterization if they are hesitant about the procedure (although many people learn the procedure quickly and easily). Anyone attempting to learn self-catheterization should do so under the guidance of a qualified medical professional. There are a variety of different catheters available. Each catheter has its own advantages and disadvantages. Talk to your medical professional for his or her advice, and try several different options to find the safest and most comfortable option for you. 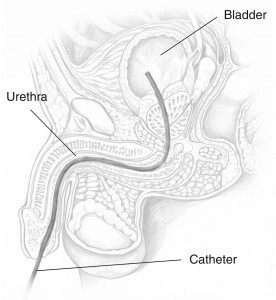 An indwelling catheter is a thin tube inserted into the urethra for long-term use. The catheter drains urine into a bag that is either attached with a strap around a leg underneath pants or a skirt so that you can be active during the day, or it is hung from the side of a bed (generally used at night, or for those who remain in a bed for long periods of time). Indwelling catheters are often used during many medical procedures, including most surgeries, regardless of whether or not the individual has incontinence. Also, in some cases of constant urine leakage an indwelling catheter is sometimes used. If left in place for long periods of time, infection will most likely occur, even with catheters that have an antimicrobial coating. It is best to try and avoid long-term use of this type of catheter whenever possible. A suprapubic catheter is a catheter that is surgically implanted through a small cut made in the abdomen (above the pubic bone). A doctor or nurse replaces the catheter regularly – about once a month. As with the indwelling catheter, the tube drains urine from the bladder into a bag. A suprapubic catheter is used in individuals requiring long-term catheterization, especially in cases making CIC or an indwelling urinary catheter difficult. 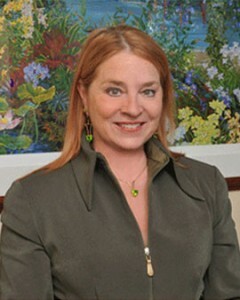 Dr. Whitmore, is the founder and medical director of the Pelvic and Sexual Health Institute in Philadelphia , PA. She is chair of urology and female pelvic medicine and reconstructive surgery as well as professor of urology and OBGYN at Drexel University College of Medicine, and program director for the University of Medicine and Dentistry of New Jersey Female Pelvic Medicine and Reconstructive Surgery fellowship. Dr. Whitmore has clinical research interests in urinary incontinence, voiding dysfunction, interstitial cystitis, female sexual dysfunction and pelvic floor disorders. She has been published extensively in peer-reviewed journals. 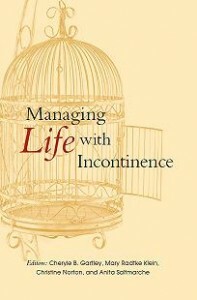 She is the author of Overcoming Bladder Disorders: Compassionate, Authoritative Medical and Self-Help Solutions for Incontinence, Cystitis, Interstitial Cystitis – and has been a contributor in the lay press . She is a frequent guest on national television and has been featured on the “Good Morning America” and “This Morning” programs. Dr. Whitmore serves on the advisory boards of: the National Association for Continence, the Simon Foundation, the Interstitial Cystitis Association, and the Women’s Health Foundation. She also serves on the government relations committee of the American Urogynecologic Society. Dr. Whitmore is board certified by the American Board of Urology. Posted in Treatments & Management for Incontinence and tagged catheterization, catheters, CIC, clean intermittent catheterization, condom catheters, Foley catheters, indwelling catheters, intermittent catheters, male external catheters, male urinary incontinence, self catheterization, self intermittent catheterization, suprapubic catheters, Texas catheters, urinary drainage.